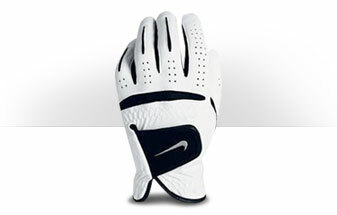 Gloves are also an important part of today’s golfing world. Many professionals, as well as amateurs, use gloves in order to get a better grip on the club, which results in better shots. First of all, you need to know which hand you want to wear your glove on. If you are a right-handed golfer, you want to wear your glove on you left hand, but if you are a left-handed golfer, you want to wear your glove on the right hand. The second step in finding the right glove for you is to find your size, and there are many sizes offered by glove companies today so you will be able to find a glove that fits you just right. There are regular sizes, and there are also cadet sizes, which have shorter and wider fingers on them. Though the name cadet may sound like a child’s glove, the glove actually has a unique fit characteristic to make sure that the glove fits your hand. All of these sizes can also be made of different materials. The most common of these materials are leather and synthetic leather. The nicer and more expensive gloves on the market are made completely of leather and as the gloves get less and less expensive the more and more synthetic you begin to see on the glove. There is also an increasing amount of elastic or mesh as the glove becomes cheaper. In addition to these gloves, there are also all-weather gloves that are meant to withstand certain types of weather. The most common of these is a "rain glove" designed to work better in wet and rainy conditions. Another type of weather glove is a "winter" glove, which is a thicker glove that is designed to keep you hands warm during the colder months of the golf season. No matter what your needs, there is a glove that is the perfect fit for you, just be sure to try it on before you buy it. The first thing you need to determine is which hand to wear the glove on. Typically the glove is worn on your top hand as it relates to your grip position. This means right-handed golfers wear a glove on the left hand and left-handed golfers wear a glove on the right. Some people prefer to wear gloves on both hands to protect from blisters and calluses. The second step is to find your correct glove size. There are many sizes offered by glove companies today, so you will be able to find a glove that fits you just right. Some of the sizes you will see are similar to most apparel; Small, Medium, Large, XL, XXL. But there are also a variety of sizes within the core sizes such as Medium-Large and Cadet sizes. Medium-Large would fit in between Medium and Large. Cadet refers to finger length and width. People with shorter, wider fingers should shop for Cadet sizes. Lastly, you need to determine which feel and deterioration pattern you prefer. You can select a material that is very soft and comfortable, such as a full leather glove, but it will wear out very quickly. The advantage is the feel and comfort, but the disadvantage is that they are expensive and wear out fast. Alternatively, you can select a more durable, firmer feel material such as synthetic, mesh, or elastic. These gloves will last many rounds but tend become stiff and slick once they are worn out. The advantage is cost as they are much less expensive than a full leather glove. In addition to the standard golf glove, there are also all-weather gloves that are meant to withstand certain types of weather. The most common of these is a "rain glove" designed to work better in wet and rainy conditions. Another type of weather glove is a "winter" glove, which is a thicker glove that is designed to keep your hands warm during the colder months of the golf season. No matter what your needs, there is a glove that is the perfect fit for you. After wearing your glove for a round let it air out for a while to dry off. When you are on the course, remove your glove between shots to keep it drier. It is never a bad idea to carry two or more gloves and change them as the round goes on. When storing your glove, if you keep it in a plastic zip-lock bag, it will keep better and last longer.